The entire concept behind this issue here is that Harley essentially holds a trial for which artist is eventually going to draw her in the regular series, which starts next month with #1. As such, there are no less than SEVENTEEN artists on hand for this issue, each of whom gets a page (a small few get 2) to show off their skills. I’ve never heard of any single comics issue being drawn by that many artists and man… I’d initially thought that this just might be a mess. I was wrong. Completely wrong. Jimmy and Amanda are the writers on this issue and they tell the story as per the premise. And their entire approach depends on Harley breaking the imaginary fourth wall between the characters and the creators/readers. Harley knows what’s happening here and she converses with both Jimmy and Amanda throughout the book as they parade all the different artists. There’s a certain insanity about Harley that is at the core of who she is, what she is. Several writers have tried to take that on and deliver it, but none have really had much success of it, off what I’ve read. Matt Kindt, Adam Glass, and have tried and failed, as far as I’m concerned. But with Jimmy and Amanda at the helm, things are looking great for the character. There’s so much great humour in this comic. The writers hit the definite beats with that and the artists do their part to make all of that stand out. 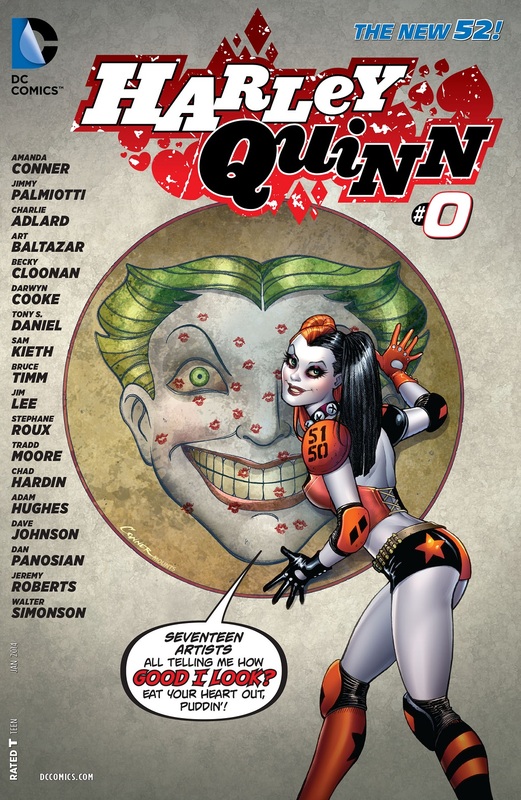 Each page features Harley in a completely different situation, or sometimes multiple situations, and through all of it she keeps on a commentary about the artist who is drawing her on that page. And all of that feeds into the story itself in really fun and interesting ways. Honestly, there isn’t really anything negative that can be said about this comic, except in one way. Where the art is concerned, between all the seventeen artists, there is absolutely no straight consistency. And we don’t even get a “normal” Harley at that. We see Harley-Zilla as she demolishes an entire city, Godzilla style. We see Tiny Harley in Art Baltazar’s Tiny Titans-themed page. We see Bruce Timm and Darwyn Cooke’s animated look. We see Harley as she looks in different costumes, different situations, whether that be a noir-style office setting or sitting in a whale’s mouth and tickling it no less. We see a hyper-realistic Harley, a stylised Harley. Seriously, what’s not to love here? If you were to ask me, I’d throw down in an instant for either Bruce Timm or Dave Johnson or Becky Cloonan or Stephane Roux or Dan Panosian to draw the monthly series. I’m pretty sure that the actual artist has already been picked by DC, but damn, this issue was a fantastic concept and I loved it. Loved it, I fell head over heals for this comic. This issue was Harley at her best, in whatever context you deem fit to talk about. I want more of this kind of perfect blend of silliness and humour mixed in with the trademark goofy Harley/Joker action. Jimmy, Amanda, and the entire army of artists have done a fantastic job here, and I can’t wait to see the “results” in next month’s issue. I was expecting this issue to be decent. It turned out to be something completely awesome. Posted on November 20, 2013, in Comics Reviews, Review Central and tagged Adam Hughes, Amanda Conner, Art Baltazar, Awesome, Batman, Becky Cloonan, Bruce Timm, Chad Hardin, Charlie Adlard, Comics, Comics Review, Dan Panosian, Darwyn Cooke, Dave Johnson, DC Comics, Funny, Harleen Quinzel, Harley Quinn, Humour, Jeremy Roberts, Jim Lee, Jimmy Palmiotti, Joker, New 52, Review, Review Central, Sam Kieth, Stephane Roux, Tony S. Daniel, Tradd Moore, Walter Simonson. Bookmark the permalink. 11 Comments.